Capitol Journal host HODDING CARTER on the streets of Jackson, Mississippi w/ state capitol building seen behind him, he segues into segment regarding America's 1960's civil rights movement. 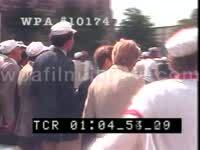 Civil Rights Sit-In Protest, 1960s (Unclean footage w/ text at bottom crediting VO speech by former MS Governor Ross Barnet): GVs rows of police patrolling street. MS protestors taking a seat in the middle of the street. GV caged police truck pulling up, pan to seated protestors. Civil Rights Sit-In Protest, 1960s: MS police removing / arresting protestors by methods of carrying or dragging. GV detained protestors being put in back of caged truck. Civil Rights Sit-In Protest, 1960s (Unclean footage w/ text at bottom crediting VO by Civil Rights Workers): Various shots of police removing protestors by methods of carrying & dragging. Civil Rights Sit-In Protest, 1960s: GV pan of caged police truck as it drives past camera, arrested protestors in the back wave to people on the street as they pass.